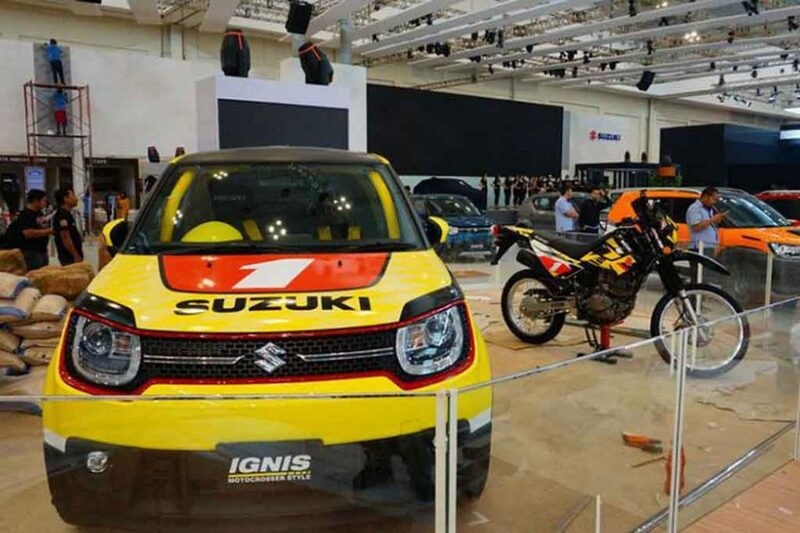 Suzuki Ignis Motocross Style Edition was unveiled in Japan in January this year and now the automaker has displayed the sporty looking car at the ongoing GIIAS 2017. The car wears a very bold and muscular look compared to the standard Ignis. The bright yellow paint scheme and decals enhance the sportiness. Up front, the black radiator grille and headlamps get a sleek red trim highlighting the entire panel. The front bumper sports a thick black and chunky black cladding. 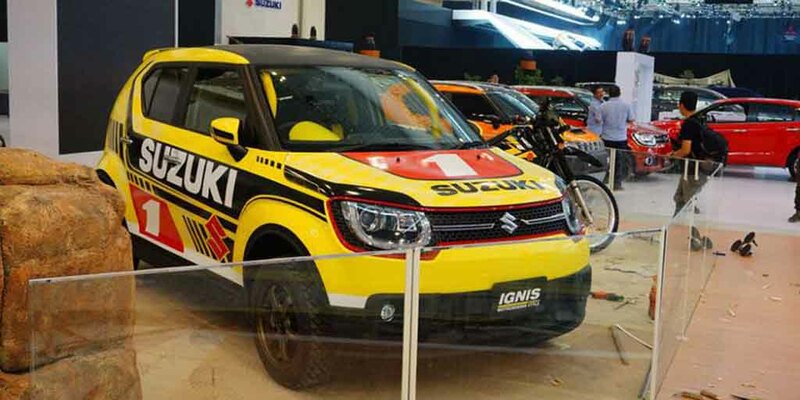 Moving to the side profile, the Suzuki Ignis Motocross Style edition gets sporty and bright decals, floating roof design, black alloy wheels wrapped with meaty offroad-spec tyres. Moving to the back, this car gets a roof spoiler, large taillights and a black bumper. The rally car appearance, 16-inch alloy wheels, red brake calipers, 185/60 R16 off-road tyres certainly help it to become a very attractive model for the enthusiasts. Inside the cabin too, the Suzuki Ignis Motocross Style edition gets Recaro exclusive bucket seats, four point harness and 6-point type roll bar. Suzuki claims that this model has been designed to deliver greater control even during high speed. The yellow trims at various places inside the cabin create a contrasting colour scheme that grabs attention easily. It gets a multifunction steering wheel, analog dial and digital MID consisting instrument cluster, a tab like touchscreen infotainment system at the centre console with Android Auto and Apple CarPlay. The Suzuki Ignis is sold through premium Nexa retail network in India. It has earned quite good response in the country with the style and features on offer. On the powertrain front, it gets a 1.2-litre petrol engine and a 1.3-litre diesel engine as well. Transmission options for the car include a 5-speed manual gearbox and there is an AMT as well.